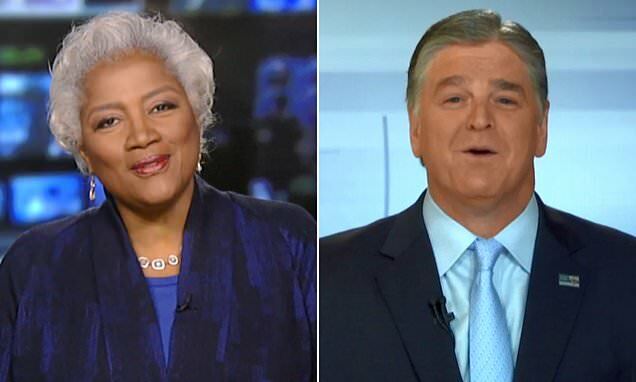 Former Democratic National Committee chief Donna Brazile went head-to-head with Fox News' Sean Hannity Tuesday night over several policy issues that face the 2020 presidential candidates. After exchanging a few pleasantries, the two kicked off the lighting round debate with a discussion about Medicare for All, an idea for a government-run health care system that has been embraced by Democratic presidential hopefuls like California Sen Kamala Harris. Hannity asked Brazile if she agreed with Medicare for All and whether or not private insurance should be banned. 'Medicare for All is not a controversial plan,' Brazile said, citing a January poll that found that Americans initially support the idea 56 per cent to 42 per cent. Brazile, who was recently hired by Fox News as a political commentator, also said that if people 'want to keep their private insurance and maintain it as I would' they should be able to. Brazile immediately responded: 'No I don't disagree with her. I hope she can explain exactly how her plan will cover every American and insure that we don't have millions of Americans who cannot afford their prescription drugs as well. Hannity then questioned Brazile about late-term abortions. 'Democrats believe that this is a choice that women should have a say in. We believe that women should have the full range of health services,' Brazile said. Hannity challenged Brazile's stance, asking if women should be able to abort in the ninth month of pregnancy. 'I am not a doctor and I am not going to tell anyone what to do with his or her body,' Brazile said.